TULLAHOMA, Tenn., Dec. 18, 2013 /PRNewswire/ — When George A. Dickel began distilling whisky in 1870, his product wasn’t stored away in barrels and left for years to mature. Instead, it was enjoyed soon after distillation to meet the demand of Dickel’s customers who enjoyed his smooth sipping spirits. This corn-forward recipe that would become the foundation of the George Dickel whiskies is now back with the reintroduction of George Dickel® White Corn Whisky Foundation No. 1 Recipe. George Dickel White No. 1 Corn Whisky is a 91-proof (45.5 % ABV) whisky with a clear appearance and initial aroma that is soft, yet full of raw grain – not dissimilar from moonshine. However, those raw notes vanish upon a mellow and smooth first taste, with a creamy sweet corn flavor. The Chill Charcoal Mellowing process nods to George’s historic affection for “Winter Whisky” and gives the liquid a softer, smoother finish than traditional moonshines. Lunn recommends enjoying George Dickel White No. 1 Corn Whisky neat or on the rocks to experience the full taste profile, but it also mixes well into a number of modern and classic cocktails like the Old Fashioned. The new variant joins a whisky portfolio including George Dickel No. 8 Whisky, George Dickel No. 12 Whisky, George Dickel Barrel Select Whisky and George Dickel Rye Whisky. 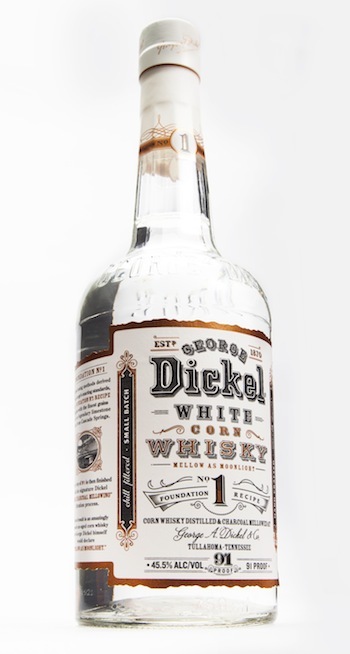 Distributed nationwide beginning in Jan., George Dickel White No. 1 Corn Whisky will retail at a suggested price of $21.99 for a 750 mL bottle. For more information, please visit the George Dickel Facebook page at Facebook.com/GeorgeDickel and remember to always drink responsibly. Since George A. Dickel bottled his first batch of whisky in 1870 using the pure water from Cascade Springs, adult consumers have been drawn to this whisky. For more information, please visit www.dickel.com and always remember to drink responsibly. Diageo is the world’s leading premium drinks business with an outstanding collection of beverage alcohol brands across spirits, beer and wine. These brands include Johnnie Walker, Crown Royal, JεB, Windsor, Buchanan’s and Bushmills whiskies, Smirnoff, Ciroc and Ketel One vodkas, Baileys, Captain Morgan, Tanqueray and Guinness.